This is probably one of the best eye bag removers out there. 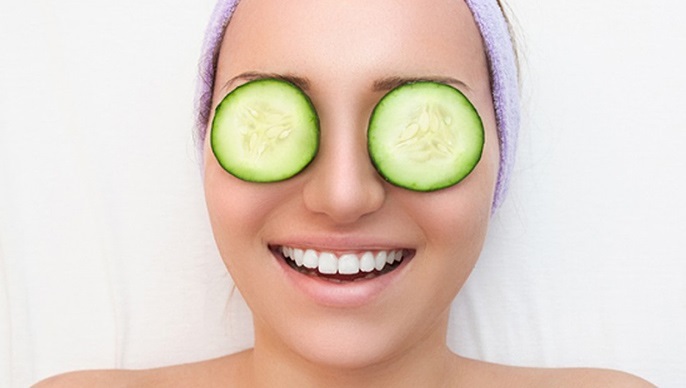 The cooling sensation from the cucumber can help soothe your eyes while its anti-inflammatory properties can reduce the inflamed area under your eyes. Get two slices of the vegetable and place them over your eyes for 25 minutes. Just sit back and relax and let the cucumbers do their thing. For those who are constantly having puffy eyes, use milk to help relieve the puffiness. Dip two cotton pads in a glass of milk and place them over your eyes. Leave them for 20 to 30 minutes before rinsing. You can repeat as many times as you want to reduce puffy eyes. Vitamin E is important for your skin’s health and what better way to reduce eye bags than applying vitamin E oil on your skin? Add a few drops of vitamin e oil into a bowl of chilled water, dip two cotton pads, and place them over your eyes and leave them for 20 minutes. Another effective remedy to eye bags is cold spoon. Simply deep four spoons in a glass of chilled water for a few minutes. Afterwards, get two spoons and place them over your eyes. The cold can help reduce the inflammation under your eyes so the puffiness will be reduced. Waking up with bags under your eyes can be frustrating but before you cancel all your plans for the day, try putting tea bags in hot water for a minute then place them in the fridge to chill them. Once chilled, place them over your eyes and leave them on for 20 minutes. Wash using cold water. You can either use black or green tea bags to reduce eye bags. Potatoes do come in handy when it comes to getting rid of your eye bags because of their anti-inflammatory properties. Put the potato in the fridge and leave it for a few hours to chill. Get two thin slices of potatoes and place them over your eyes. Make sure that the slices cover the affected areas. Leave them for 20 minutes.